Negotiation and conflict management is a major help when trying to achieve business success. It should also be noted that negotiation management and conflict management, although somewhat related, are actually two different subjects. Negotiation is actually known as the process of communicating the needs and demands of two or more parties with an aim of reaching a unified agreement regardless of their different ideas and needs. Negotiation is also known as a collection of behaviors involving sales, communication, sociology, marketing, conflict resolutions, assertiveness and psychology. Negotiation management is capable of providing you with all the essential skills and tools that you need for successful negotiations and in effectively supporting the negotiating parties during the five major phases of the negotiation process including preparation, organization, analysis, execution and control. Conflict management, on the other hand, refers to the process of implementing strategies to reduce or limit the negative impacts of issues and conflicts within an organization. It aims to improve the group and learning outcomes and the performance and effectiveness of an organization. However, the process does not focus in avoiding or fully eliminating conflict since conflicts are known to be extremely useful in increasing group outcomes provided the said conflicts are properly managed. It only aims to reduce conflicts and deal with all these in a more efficient manner. It should also be noted that proper conflict management requires you to learn the basics of negotiation management. This is the main reason why you have to enroll in a negotiation and conflict management certification program especially if you are aiming to flourish in this field. If you are planning to take up a negotiation and conflict management certification course from a reputable company, then Brainmeasures is your best choice. This online certification and testing company has been around for a long time already and it has never failed to satisfy the needs of their students and practitioners to learn everything about their chosen course. The negotiation and conflict management course offered by the company is guaranteed to help you hone your negotiation skills and your ability to manage conflicts. The program comes with a conflict management exam created by experts and primarily designed to determine if you already have an adequate knowledge in negotiation and conflict management. You have to be serious in fully understanding the theories and principles behind negotiation and conflict management especially those that revolve around interpersonal, inter-group, environmental and organizational conflict and crisis negotiations so you can successfully pass the exam and get your skill certificate. 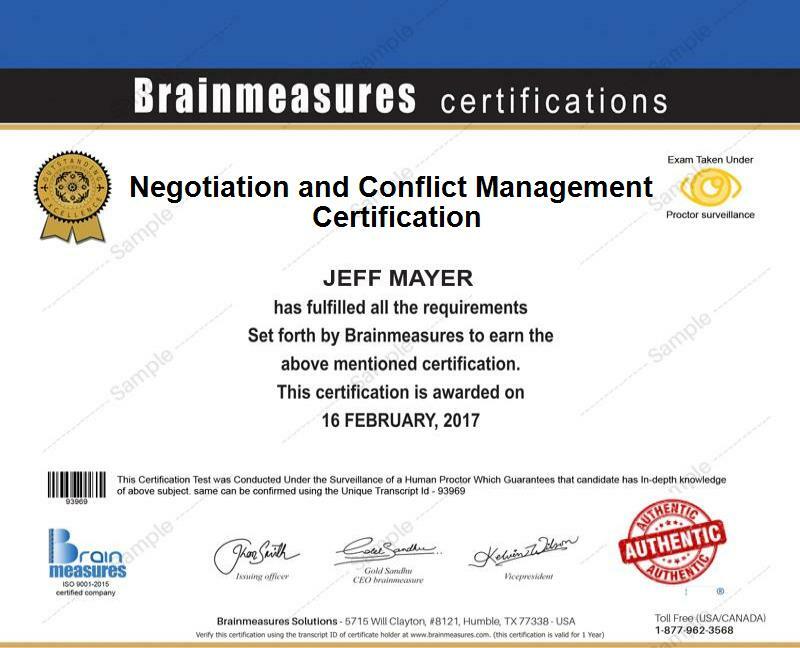 The negotiation and conflict management certification program offered by Brainmeasures is extremely beneficial to a lot of individuals. This program is actually ideal for senior executives, directors and general managers whose tasks and responsibilities involve negotiating and implementing new business deals while also resolving or managing conflicts. Negotiation and conflict management certification holders can expect to earn higher when compared to those that are not yet certified. Expect to earn an average salary of $62,000 once you start to practice your expertise in the field.